Safety in the wood shop is important. You’re almost certainly familiar with all of the big shop safety rules and apply them whenever you’re working on a piece. Have you ever stopped to think about how different the safety requirements are for different pieces of equipment, though? 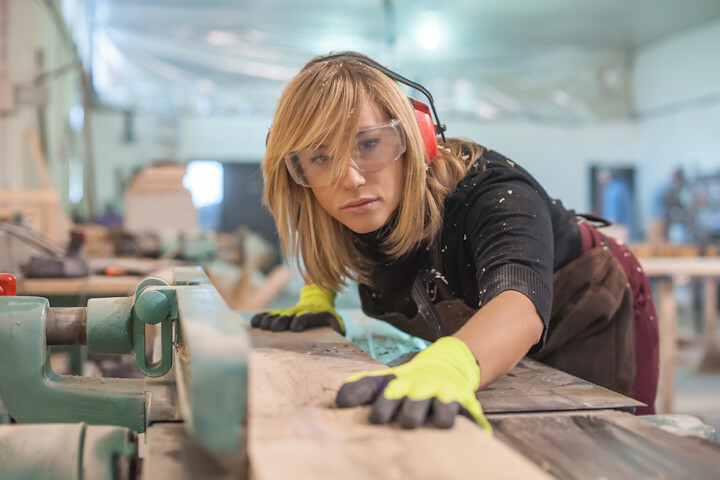 Consider a table saw… that’s one tool that you never want to reach across when you’re working, even though reaching across a piece of wood when you’re working with some other tools wouldn’t be as big of an issue. Routers are another piece of equipment that have their own safety rules. Unfortunately, not all of these rules are as obvious or well known as our table saw example above. If you’ve never stopped to think about staying safe specifically while using a router, here are a few things to keep in mind. Even if you already do most of these things, a little refresher in best safety practices never hurts. This may seem like overkill at first, but you can’t be too careful when handling router bits. All it would take is a second for a bit to do some serious damage while you’ve got your fingers on it. It only takes a moment to unplug the router and then plug it back in once the bit has been changed. That brief moment can make a world of difference when it comes to safety. Different bit sizes work best at different RPMs, and using the wrong speed for your bit can damage your wood, the bit and possibly your router. Bits come with recommendations for maximum RPMs, and charts are available where you can look up the optimal speed for a wide range of bit diameters. One of the worst things that can happen when using a router is for your wood to move; this not only damages the wood, but the speed of the router bit can shift it around and cause it to hit you or other people. Clamp it in tight or use a guard with your router fence to keep it from shifting around. Once secured, make light passes and feed the wood against the rotation of the bit. Hearing protection is often overlooked in the wood shop despite how loud some equipment can be. With routers, though, it’s all but essential. You may have heard routers described as “screamers” because of their high volume during operation; this can damage your hearing over time, and the damage will likely be irreversible. Buy high-quality hearing protection that can handle high decibels and make sure that you put it on every time you’re about to turn on a router. Remember that these rules are intended to supplement your usual shop safety rules, not replace them. As with any other woodworking tool, protect your eyes and hands every time. Check your equipment for damage or shorts every time. Use clean materials every time. If you would do it when working with anything else in the wood shop, do it when working with a router. How about the hair treatment from posted photo? and not a word about the long hair over the jointer?